The technique makes it possible to study motor neurons of the human central nervous system in the lab. Unlike commonly studied mouse motor neurons, human motor neurons growing in the lab would be a new tool since researchers can't take samples of these neurons from living people but can easily take skin samples. "In this study, we only used skin cells from healthy adults ranging in age from early 20s to late 60s," said senior author Andrew S. Yoo, PhD, an assistant professor of developmental biology. "Our research revealed how small RNA molecules can work with other cell signals called transcription factors to generate specific types of neurons, in this case motor neurons. In the future, we would like to study skin cells from patients with disorders of motor neurons. Our conversion process should model late-onset aspects of the disease using neurons derived from patients with the condition." "Going back through a pluripotent stem cell phase is a bit like demolishing a house and building a new one from the ground up," Yoo said. "What we're doing is more like renovation. We change the interior but leave the original structure, which retains the characteristics of the aging adult neurons that we want to study." To convert skin cells into motor neurons, the researchers exposed the skin cells to molecular signals that are usually present at high levels in the brain. Past work by Yoo and his colleagues—then at Stanford University—showed that exposure to two short snippets of RNA turned human skin cells into neurons. These two microRNAs—called miR-9 and miR-124—are involved with repackaging the genetic instructions of the cell. In the new study, the researchers extensively characterized this repackaging process, detailing how skin cells reprogrammed into generic neurons then can be guided into specific types of neurons. They found that genes involved in this process become poised for expression but remain inactive until the correct combination of molecules is provided. After much experimentation with multiple combinations, the researchers found that adding two more signals to the mix—transcription factors called ISL1 and LHX3—turned the skin cells into spinal cord motor neurons in about 30 days. The combination of signals—microRNAs miR-9 and miR-124 plus transcription factors ISL1 and LHX3—tells the cell to fold up the genetic instructions for making skin and unfurl the instructions for making motor neurons, according to Yoo and the study's co-first authors, Daniel G. Abernathy and Matthew J. McCoy, doctoral students in Yoo's lab; and Woo Kyung Kim, PhD, a postdoctoral research associate. Another past study from Yoo's team showed that exposure to the same two microRNAs, miR-9 and miR-124, plus a different mix of transcription factors could turn skin cells into a different type of neuron. In that case, the skin cells became striatal medium spiny neurons, which are affected in Huntington's disease—an inherited, eventually fatal genetic disorder that causes involuntary muscle movements and cognitive decline beginning in middle adulthood. In the new study, the researchers said the converted motor neurons compared favorably to normal mouse motor neurons, in terms of the genes that are turned on and off and how they function. But the scientists can't be certain these cells are perfect matches for native human motor neurons since it's difficult to obtain samples of cultured motor neurons from adult individuals. 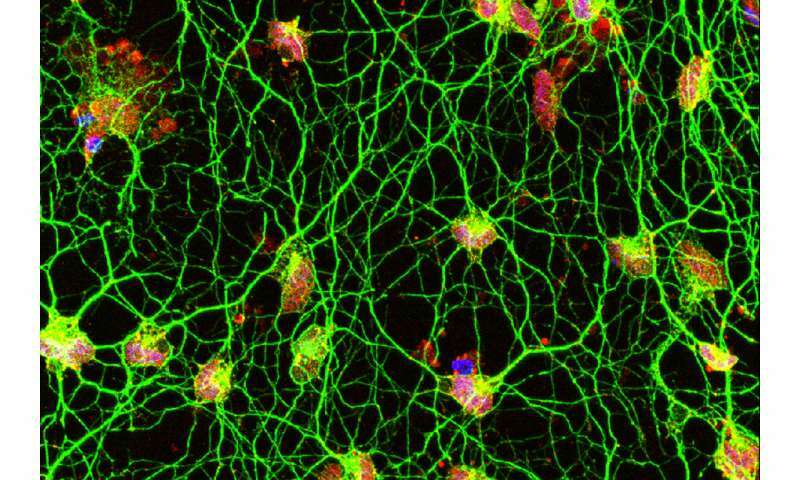 Future work studying neuron samples donated from patients after death is required to determine how precisely these cells mimic native human motor neurons. More information: Abernathy DG, Kim WK, McCoy MJ, Lake AM, Ouwenga R, Lee SW, Xing X, Li D, Lee HJ, Heuckeroth RO, Dougherty JD, Wang T, Yoo AS. MicroRNAs induce a permissive chromatin environment that enables neuronal subtype-specific reprogramming of adult human fibroblasts. Cell Stem Cell. Sept. 7, 2017.